Author Tara Omar shares her experience working with a penguin hospital with SANCCOB, in Cape Town, South Africa. This edition of Sunday Brunch is a fascinating interview with Tara Omar, author of “The Merman’s Mark”, a fantasy adventure to be released on 7/24/2015. Tara is an American living abroad in Cape Town, South Africa. Tara shares her experience working in a penguin/seabird hospital for the Southern African Foundation for the Conservation of Coastal Birds (SANCCOB). Tara provides a fascinating and enlightening account of the life of penguins and seabirds, and the challenges of their rehabilitation. TGNR: Thank you for joining us today, Tara. TO: Thank you for having me. TGNR: Let’s talk about you. TGNR: Clearly you’re someone who must have a natural inclination toward animals , in combination with a strong sense of social justice. How did that develop over the course of your life? TO: My sense of social justice began at a very young age with the empathy that I imagine is natural to most children. My mother took great care in fostering that inclination, often using stories of other people’s “hurt feelings” to teach us moral lessons and proper behavior. I’m not sure if it was entirely her teaching or partly my own imagination, but everything in that young world had a heart that could be broken. I remember being very worried once as a small child that my clothes hangers would get lonely without shirts on them. Growing up a bit I think animals were a natural progression from clothes hangers. I’m also a very visual person so I feel comfortable around animals where you have to take a lot of visual cues for communication. TGNR: Despite all the changes and challenges that come with living in a new land, it seems to have presented a unique opportunity, not simply to work with cute animals, but to actively pursue a very worthy cause. Given the various environmental challenges in South Africa, many of them having to do with oil pollution as I understand it, you’re actively involved in protecting a particular threatened portion of the animal kingdom. How did you discover SANCCOB? TO: I came across their website several months ago and saw they had a volunteer program, so I contacted them. The rest is history. SANCCOB is famous for saving oiled birds, but the majority day­-to­-day is saving seabirds that are ill for various reasons. Many coastal birds eat rubbish on the beach and become ill. They are brought in as well. Most penguins are injured. The younger ones may have been abandoned. Eggs could’ve been laid in inhospitable breeding grounds (like on a golf course, for example). They’re all brought to SANCCOB. They’re basically a hospital for coastal birds. TGNR: So you volunteered to rehabilitate seabirds, and in this case we are talking mostly Penguins. How did SANCCOB bring you into the fold? TO: I applied as an international volunteer, working full time for six weeks. Locals can also apply, with the expectation they work one full or two half days a month. You start with cleaning and preparing food and progress to handling, cleaning pens, feeding and tubing, preparing meds and filling in records. There are hundreds of birds and only a handful of rehabbers. It’s a pretty steep learning curve. TGNR: In the beginning, what of your specific tasks were a genuine surprise to you? Of course we all enter a new situation with some impression of what it will be like, and what to expect. What part of your time has stuck out to you that you never initially expected? TO: I was really excited that the opportunity to work with the birds hands ­on was available, but was equally surprised at how intimidating the experience initially was. Adult penguins are very proud birds and can turn quite aggressive when handled. The first time I actually managed to handle a difficult adult I felt like I had wrestled a lion. Being short was also surprisingly challenging. A lot of their fences kept me in just as well as the birds, but you learn to work around it. TGNR: Now you and I are talking penguins. What types of penguins do you most often find yourself working with? Also based on your overall impressions, how would you describe the essence of a penguin? I understand this may differ from type to type, but can you articulate the fundamental nature of the birds you’ve worked with personally? TO: The centre works mostly with African penguins which are native to the coast of South Africa and Namibia. )A penguin leads a double life. Watch them on land and they’re adorably awkward, chubby little things that like long waddles on the beach with their significant other. Watch them in water and it’s a whole different story. Fast, streamlined, silver bullets with the toughness of iron. I’ve never owned fish so I can’t say if they’re similar, but their talents really seem to shine in the water. I have owned birds and they do seem to have that proud, methodical discipline that birds have. But of course personality differs from bird to bird, what they’ve lived through, if they’re wild, injured, or hand-­raised, their age. Very much like people in that respect. TGNR: What does your typical day on the job look like? 5:00 Turn down service. Sardine smoothies served. From a medical perspective, the drinks wash down daily meds; the sauna helps clear respiratory ailments; sardine smoothies bulk up underweight penguins and all the pool time tests feathers for waterproofing. But hey, tomato…potato… some penguins should learn to be less sassy. The birds have a “shower” or are sprayed down after eating to remove any fish oils from their feathers. The oil ruins the waterproofing. From what I understand, birds aren’t naturally waterproof, they must preen themselves by interlocking their feathers individually. )TGNR: In a rehabilitation setting, there are clearly standards by which a seabird is released back to the wild. What criteria does SANCCOB use when deciding it might be time to let them go? TO: There is a checklist of criteria penguins must meet before being released. From what I know, they must be in good health and of a healthy weight, waterproof and wild. If a bird has become tame it cannot be released. We’re not allowed to pet them or talk to wild penguins, which is a lot more difficult than one would think, especially if a bird is nervous. Taming is of greatest concern for the hand rearers, though, especially with the bank cormorants. 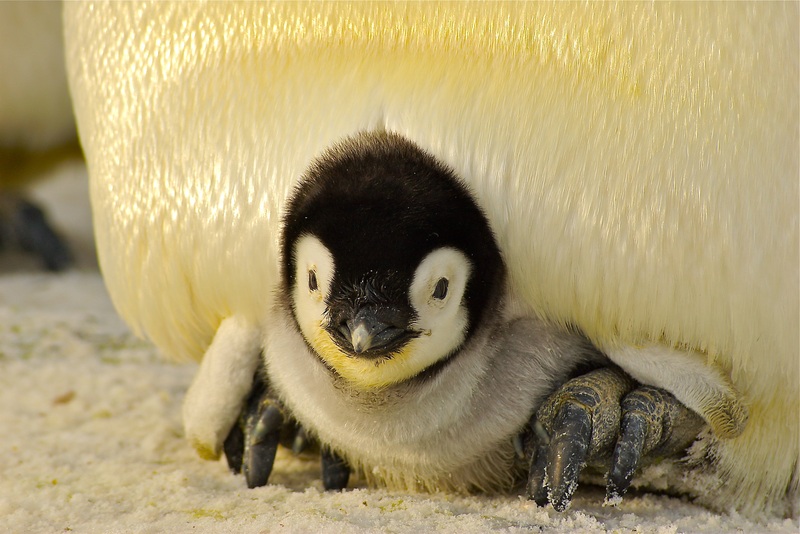 As chicks, penguins imprint on people but also on each other, so they can lose any attachment they have to humans as they grow, provided it’s not encouraged. I was told bank cormorants, on the other hand, imprint quite easily on humans so there has to be a lot of care in making sure they don’t become tame. Eggs, chicks, very young and very ill penguins are generally handled by interns and staff members. Volunteers handle the healthier blues, juveniles adults, and chicks that have lost majority of their fluff. TGNR: What does the rehabilitation center include? What is the layout? TO: The parts of the centre include a wash bay for oiled penguins, though not used when I was there. ­- General, where they prepare formula, do laundry and dishes; admissions, where all birds admitted to the centre receive an initial and subsequent weekly vet checkups. – Intensive care unit (ICU), indoor and outdoor, depending on the severity of the illness. – Pen 1, which is outdoor ICU for flying birds. – Aviary, for recovering flying birds. ­- A nursery for older chicks. ­- A Home Pen for birds that cannot be released, and then various pen numbers for whatever is needed. There are also various offices for research, marketing and administration, and an education room where they host school children and private functions. TO: There are quite a few penguins in home pen; I’m not sure what all their issues are. Some birds I saw include a penguin with an amputated foot, and one with a twisted beak, along with the centre’s only rockhopper. Rockhoppers are from farther south; she stays at the centre because the research is unclear as to whether she could introduce diseases from here into her colony if she were returned. She’s been tamed and is now an ambassador bird. TGNR: Changing gears a bit, lets talk about animal intelligence. As research continues, the findings seem to say animals are much more intelligent than we humans often give them credit for. In your experience working with these birds, what has been your impression of their intelligence and cognitive abilities? TO: It’s difficult to say. Penguins in rehab are under a lot of stress with their illness or injury, coupled with the unnatural environment. I also haven’t worked with them long. But they definitely give the aura of having emotional intelligence. TGNR: Would you give an example? TO: Well, for one thing they’re monogamous… that takes some pretty potent emotional intelligence I’d say. TGNR: When reading your “Penguin Therapist” blog, there seems to be a fascinating character. Tell me about 138. TO: This is an entry from the blog the tells the story well. TGNR: Houdini incarnate! I would encourage people read about some of his most daring and cunning exploits here: “A Battle of Wits”; “Manic Penguin Bodyguards…”; and “A Stressful Goodbye”. TGNR: In reading some of your posts, there is clearly a personal evolution regarding your approach to working with these seabirds. In the time you have worked there, how has your approach been enhanced and refined when working with them directly? As you mentioned given the setting of a seabird hospital, it is a scenario that invites any number of possible situations. Clearly you have adapted to the challenge, but how so? TO: The biggest adaptation to challenge is overcoming personal stresses and fear. If the bird senses stress or fear they will react, causing you to be more stressed, causing the bird to be more stressed, and the whole thing will spiral toward a psychiatrist’s couch in a hand basket. For a while I struggled a lot with adult penguins, my feeding was mediocre and my tubing skills were near disastrous. Working with adult penguins was like working with a really small, really angry parent. They felt more mature than me, and beyond worrying about bites, psychologically it felt disrespectful/intimidating to pick them up. For a long while I preferred working with birds that required a gentler approach, like the young Hartlaub’s gulls and other small, flying birds. Then the last day I told myself, “This is it. You have to get this.” And I did. Not one penguin struggled during feeding, and I managed tubing with little fuss. I don’t think I was really any physically stronger than day one, but I was a lot stronger mentally, and the birds held still. It was really important for me to get it because I’d like eventually to continue work as a local volunteer, and I feel I’d be of much more use if I have the skills. TGNR: If there is one thing you would want people to know about these birds, but likely do not, what would it be? TO: Penguins can be cute and adorable with funny waddles and awkward noises, but they are also ancient birds. They carry that aura of old wisdom about them much like a crocodile or a coelacanth that’s survived millennia more than we have. Being endangered, I hope it’s not the end of an era. What was also surprising to me was the mind­ boggling amount of effort and resources it takes to mimic what these birds do naturally. Incubators, heat lamps, mats, pens, medications, the long hours by staff members and volunteers 365 days a year, the laundry, cleaning detergents and disinfectants, the freezers upon freezers full of fish. I always thought conservationists had a strong message but might mingle a bit in melodrama. Now it seems more justified that I’ve seen an example of what it actually takes to correct a mistake… to try to save a dying species. We’re running nature almost like a debt-­ridden business. Rather than taking all that effort and improving from a certain point, we must work like mad to get back to where we were fifty years ago. We must buy fish by the truckload to try to salvage a species hit hard by overfishing. Or take a bird through a month of rehab for ingesting plastic that could’ve been thrown in a recycle bin in half a second. Rather than a complicated jumble of mess up­-clean up, it would’ve been so much simpler just to let a penguin raise a penguin and leave them alone. Or toss that plastic wrapper. I’m not the preachy sort, but really, it’s a lot of work. Like rebuilding a block tower. TGNR: Thank you for your time Tara. I would encourage our readers to explore your upcoming writing debut, “THE MERMAN’S MARK,” a fantasy adventure. It is set for release on Friday, July 24th. Also visit SANCCOB, and explore their immense mission. You can explore Tara’s book, “The Merman’s Mark” by clicking this link.